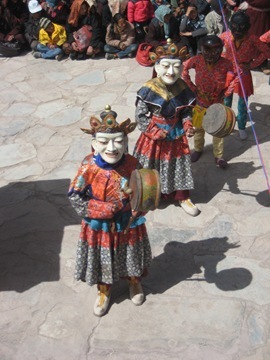 What brought me to Ladakh was the Nagrang Festival at Matho (Mangtro in Tibetan language) which involves two oracles with unique charisma. They are famous for their predictions and scolding/exposing people with impure thoughts among the assembly crowds. 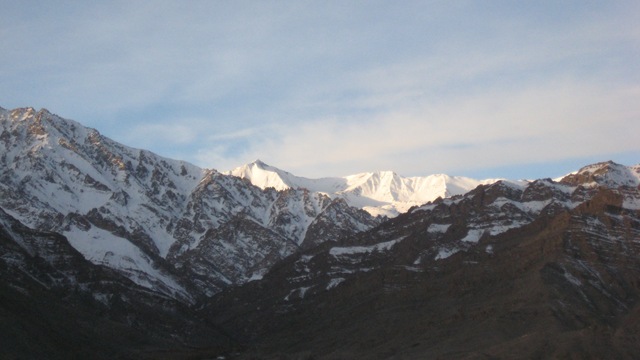 The two orcales, Rongtsen Kar Mar, i.e. 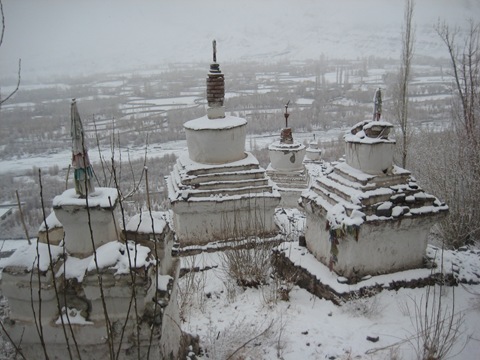 White Rongtsen and Red Rongtsen, came from the Kham area in Eastern Tibet. 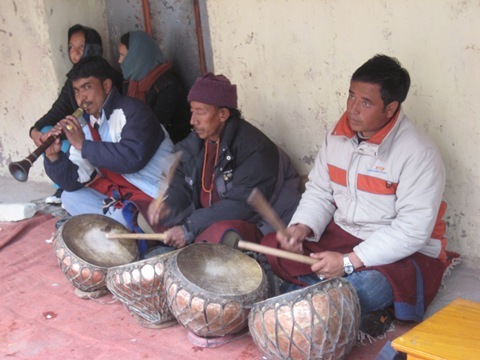 They followed a great practitioner named Dorje Palsang from Kham because of his high realization. 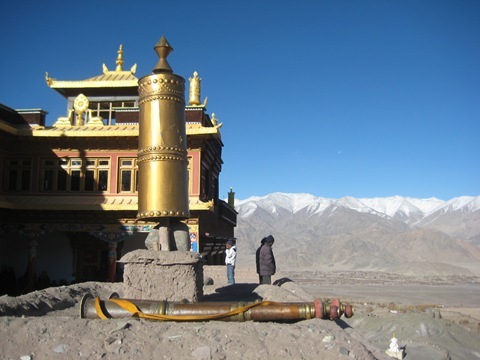 Dorje Palsang travelled around and eventually came to Ladakh where the king was so impressed with his realization and miraculous power. Thus, he was granted vast pieces of land. Somehow he decided to build a monastery in Matho to benefit the people here. 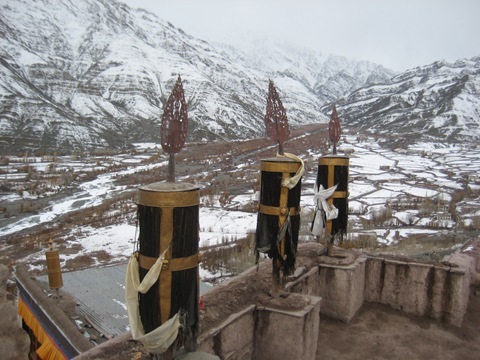 Ever since, the two Rongtsens settled here to guard Dorje Palsang’s activity in accordance to their oaths. 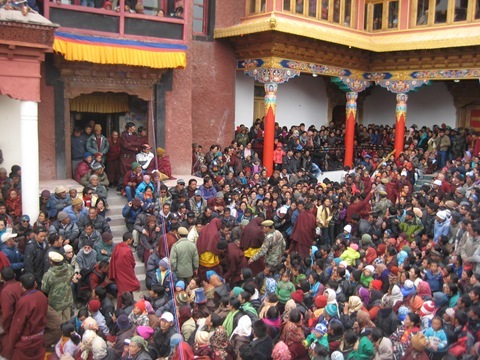 Every year, during the 10th-15th of the first month of Tibetan lunar calendar, the two Rongtsens would come to two chosen monks. 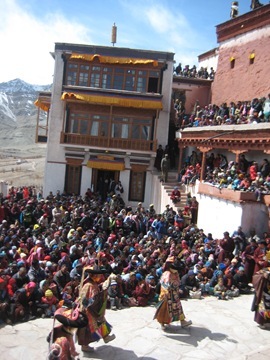 During these few days, they perform various tasks from assigning tasks to monk/lay people during the festival, blessing the monastery and the assemblage, making predictions in accordance to requests, giving advice on practice…People from all over Ladakh and even overseas come to see them during this period. The Red Rongtsen is always the more fierce one. Both of them would wave their sabers around and toward themselves, and sometimes Red Rongtsen would have so much blood from cutting his own tongue. Fortunately all these wounds would fully recovered within a day. 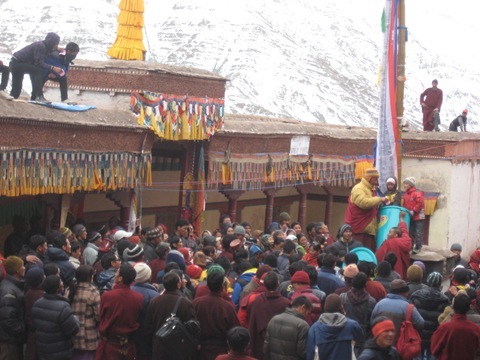 A few years back, once he was very mad and yelled at the Rinpoche conducting the event, saying that nowadays people lack of devotion so they do not want to come any more, and wrathfully blamed the Rinpoche summoning them. Later on both HH Sakya Trizin and Luding Khenchen Rinpoche wrote some letters to remind them of the their own vows. Apparently it worked so they still come every year afterwards without yelling at other Rinpoches. Rongtsen Karpo (the White one) is the more peaceful one. I always felt worried about him when they ran swiftly on the rooftop walls because he always looked up unfocusely at the sky and the way he walked was as if he were drunk. Once a 3-year old kid wandered out of the crowd and walked by him while he was wielding the saber fiercely. Yet when the kid getting nearby, he suddenly stopped the waving around and hacking, extended the saber gently and blessed the kid by placing the saber on the crown of the kid with great loving-kindness. Tens of thousands of people flooded in during the last two days of the festival. Many policemen came to assist keeping order for safety reason. When Rongtsens did not come taking over their bodies, the two monks would have their head/face covered with a shawl and hold burning incense in public areas, but most of time they would stay in their respective houses doing rituals. 巴庫拉仁波切也來看瑪透的榮贊，五歲的他戴著小小的黃帽，超級可愛。The 5 year old Bakula Rinpoche also came with his super cute little yellow hat. The snow was mostly gone on my second day of arrival. 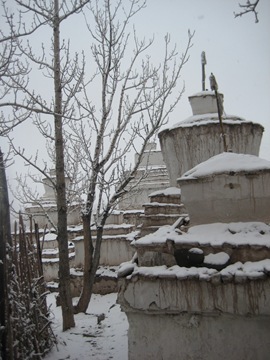 I told Lama that I would like to come back next time when the Tibetan New Year falls in January so that I can see the monastery with more snow. The Matho protectors were very kind to fulfill that wish. On the last day of the festival, I woke up and discovered the whole area was covered by snow overnight. On the last day, Rongtsens not only ran around on top of the narrow walls like this one as what they did in the previous days, but they also had their eyes blindfolded! 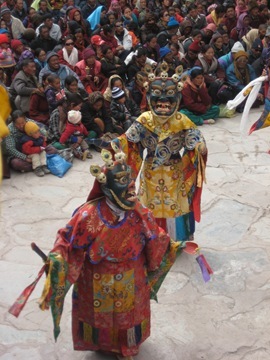 They also had their bodies painted in black with Mahakala faces on both the chest and the back and only put on tiger/leopard skin skirts and shoes in freezing temperature. Instead of the sabers, they held damarus. It was such a special moment to watch them sounding the damaru and walking around (blindfolded), just like the scene described in ancient texts came alive. After the festival ended, the monks drew lottery from the lottery tickets they sold in the past few days for fund raising. The 1st prize of 20,000 Rupees went to a monk still physically in Ngor Monastery in Manduwala. 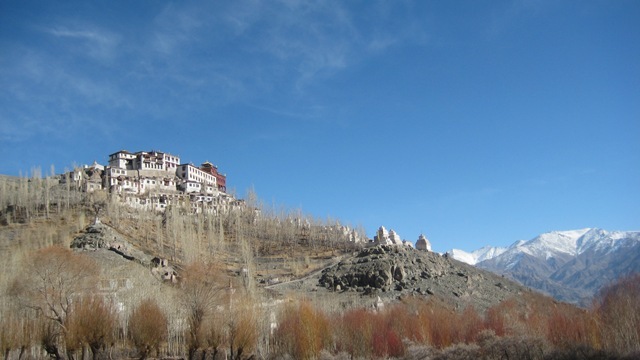 Last time when I came to Ladakh, I was physically ill. This time I was mentally unfit. 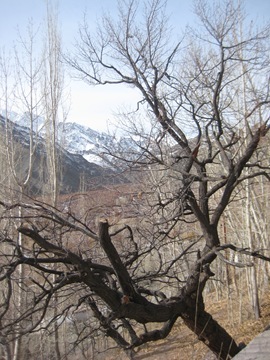 Yet each time this place simply recharged me back to a happy and well state shortly after arrival. 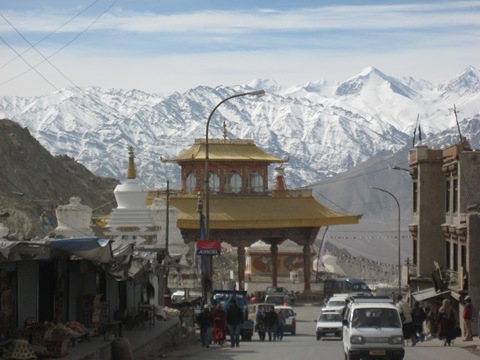 Maybe it is because of the blue sky and fresh cool air, or maybe simply because it feels like returning home whenever I come to high attitude places (Leh is at about 3500m high). 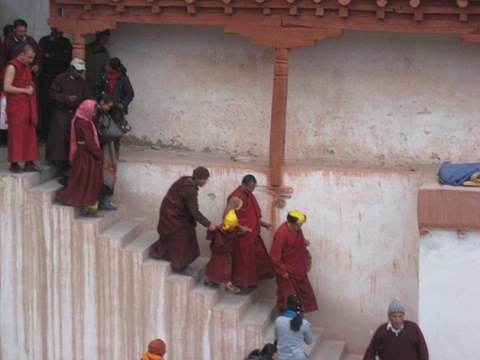 Also, unlike in Delhi, Ladakhi people are friendly yet do not bother you excessively, or at all. 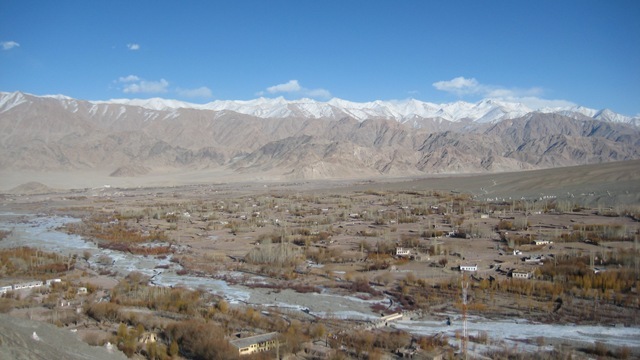 As Lonely Planet put it, Ladakh is a rare place in India where it is traveler friendly and yet so hassle free. 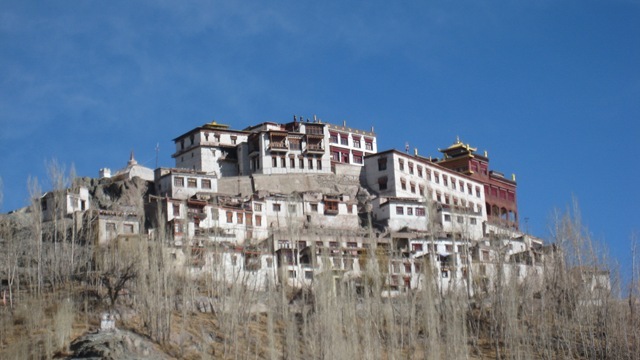 Luding Khenchen Rinpoche’s monastery, Mangtro Monastery (Matho Monastery), is about 30 min away by car from Leh. 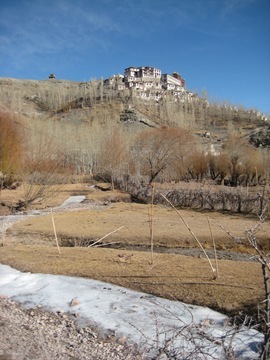 The monastery is just amazingly beautiful, located on a hill top, surrounded by snow capped mountains and overlooking the Matho village. 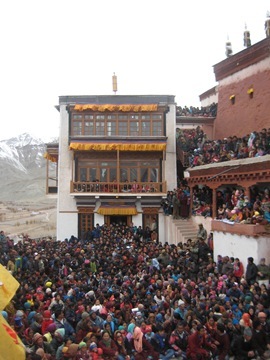 Lama was very kind to let me stay in his room right by the monastery so that I do not need to travel from Leh everyday to see their famous annual oracle festival. Staying close to the monastery also saves me from climbing up to the monastery from the village. His nephew and niece were also very kind taking care of me. They do make me feel very much welcome here. 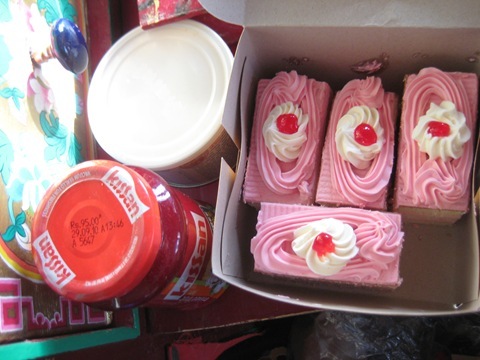 Last night, Phuntsok brought me cakes, bread, jam, spread cheese and various things as he was worried that I might not get accustomed to the food here — but actually Lhamo, his young cousin now studying in high school, has been serving me so much food with her wonderful cooking. I can not recall myself being able to cook anything at all, not even an omelet, in my high school days, so am really impressed at her cooking talent. As I really do not need so much food, I turned down some other stuff but happily accepted the cakes. Even seeing the cakes makes me happy. It is the considering gesture that makes me feel so touched. 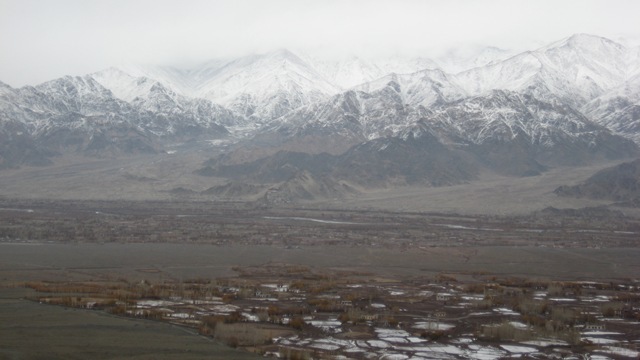 Everybody warned me that Ladakh in winter would be extremely cold. I told Lama that that I can live in very simple place, just need a bed to sleep at night, but please find me a bed in a room with fire! ( was thinking of the traditional fireplace in Tibetan family). No electricity and water was expected, but actually he has a mini solar system good enough to power the lighting, TV and my various gadgets. 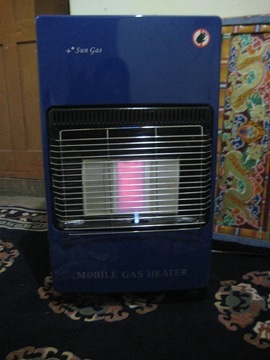 Moreover, he borrowed this gas-heater which Indian government provided to the Choglamsar flood victims (Lama’s youngest sister lost her house and everything in the flood). The heater heats up the room very well. Indian government can exceed expectation sometimes. 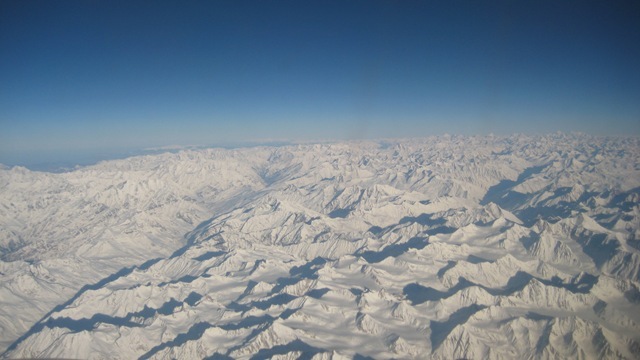 One day I asked Lhamo to take me to Leh. 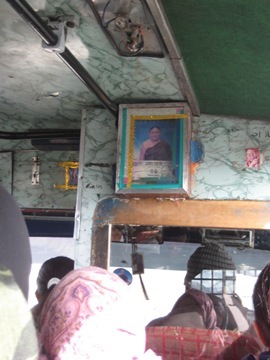 It was a pleasant bus ride – a photo of HH Sakya Trizin worshiped in the bus and throughout the trip, there were always some ladies chanting mantras. Also very impressed at how the youth would always yield seats to the senior. I really appreciate Matho people! I did tsog offerings for two consecutive days. 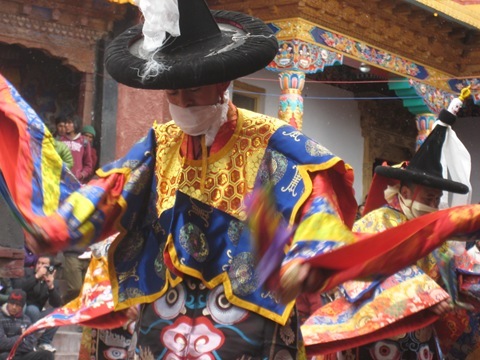 First day was the 10th based on the Chinese calendar and the 2nd 10th day was based on the Tibetan calendar. There are many birds in Matho. Every morning when I went up to the rooftop, there were always over 10 of these pretty birds resting there while all offerings had already been completely taken 🙂 Though I am quite fond of the monkeys in Manduwala, knowing birds having enjoyed my offerings does bring extra joy. 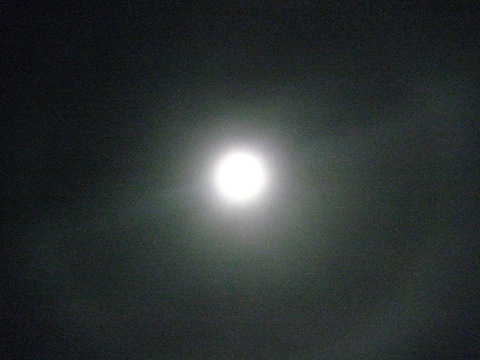 On the night before the last day of Hevajra Puja and the 3rd night of the appearance of the two Rongtsen oracles, there is this amazing light-cloud circle around the moon, formed by smoke-like clouds while stars can still be vividly seen in the clear sky. 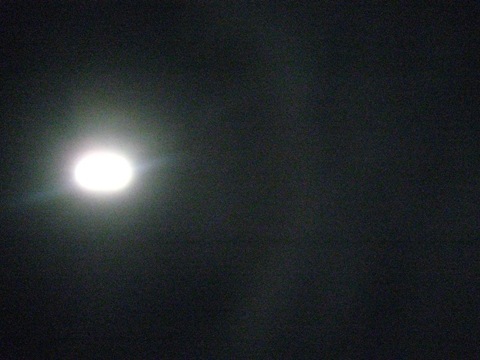 With the moon light, it seems like a ring of light surrounding the moon. Again, pity that my camera is not good enough to capture this amazing vision. The last day of Hevajra Puja was concluded with the dissolution of the sand mandala. 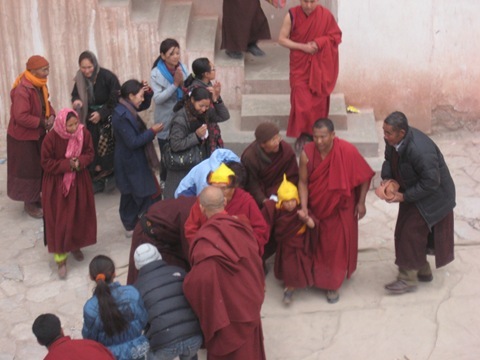 The two oracle monks also came. When they are not in trance, they have head and face completely covered with long shawl, which adds more mystic flavors to their majestic being during this special period. Standing close to them is an aweing experience. Headache, diarrhea, coughing, running nose, period…you name it. They all hit at the same time. 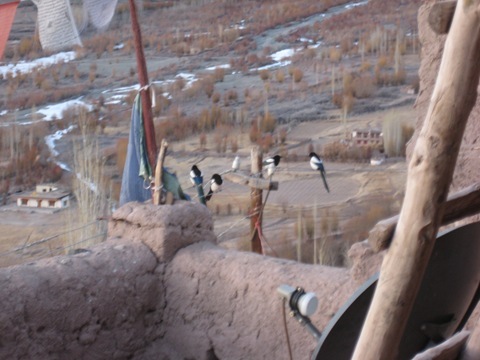 I only decided to go to Ladakh three days before my schoolmates’ departure yet I started hesitating when buying the tickets. 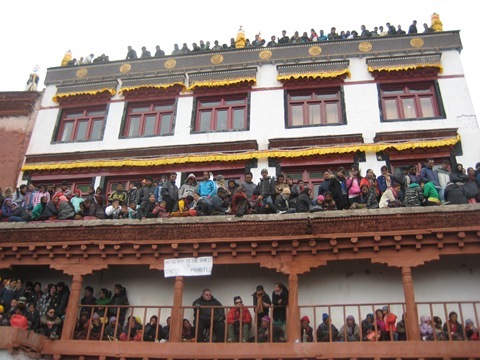 After walking around the Boudha stupa for awhile, I decided to go only 5 days after them for no specific reason. Because of this irrational decision, I got to attend the suddenly announced teaching by Khenchen Appey Rinpoche. This is like once in a life time, very rare and precious opportunity so I feel so fortunate. But lying alone on the bed while feeling very sick does make me feel very vulnerable. I almost vowed that I’ll never come to India alone, just almost…then thought maybe this is a way to purify some defilements/downfalls so maybe all not that bad. 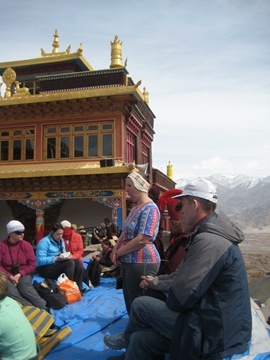 My headache disappeared when I arriving at Leh, yet I still felt very illed on the first day. Therefore, I decided to simply relaxed and do nothing in this trip. Thanks to the Californian nun who came here earlier and negotiated a very good price for a semi-luxury hotel. At least I had a quite good room to stay. 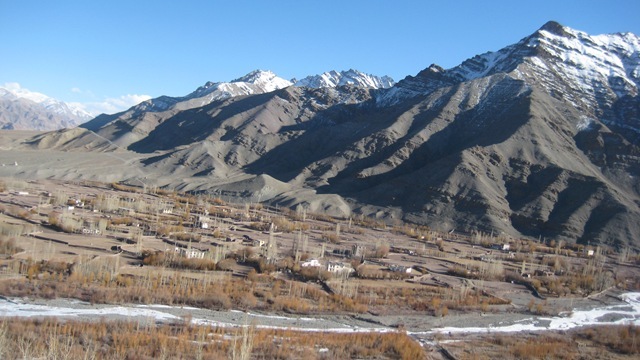 The apricots in Ladakh are a must-try. Extremely juicy, sweet, soft…also the pears. I brought back some for the IBA mates and Isabel said it’s like ambrosia! 沿路都有賣乾果和蔬果的。Sellers at Main Bazaar for dried fruits and fresh veggies. 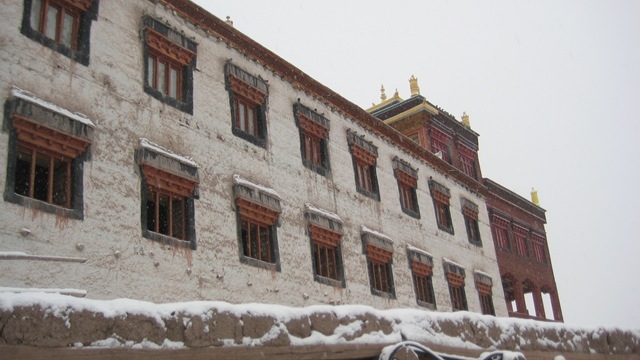 Similar to Lo Manthang, the palace and monastery stand out in the city. However, except for Buddhists, there are also a big population of Muslims so you can hear broadcasting from the mosque several times a day throughout the city. 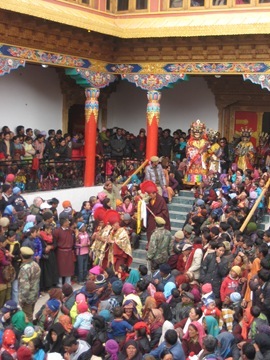 Yet the majority Ladakhis and the royal family are Buddhists, their language preserves ancient pronunciation of Tibetan language and the clothes is also slightly different from other parts of Tibet with unique hats which surprisingly don’t provide too much shade from the burning sun here. Apart from the Pashmina all over the place, my Argentina friends found these 2 shops in the old town where they can dye whatever color you need on cotton stuff within a couple of hours. So that became their hobby there on top of shopping for Pashmina scarves and stones.